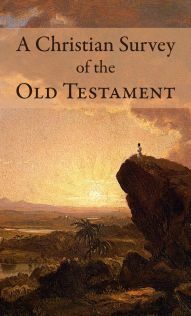 A Christian Survey of the Old Testament explores how the Old Covenant prepares for the New Covenant in Christ in dramatic and mysterious ways. We see God’s character displayed in the beginnings of the world and of man. But sin appears, and its terrible consequences bring the just judgments of God. God then shows His love and mercy in setting apart one family to become His very own people. God redeems them from slavery, gives them His Law, and declares to them His holiness—and they willingly enter into a national covenant with Him. By God’s grace, they become a great nation reflecting the Kingdom of God: His people, in His place, under His rule. By His prescribed sacrifices, sinners can live with the holy God in their midst. Yet from this blessed place, the united kingdom divides, and Israel and then Judah fall prey to pride, idolatry, formalism, and spiritual adultery. God sends His prophets to their kings, repeatedly calling the nation to repentance and faith. But the people will not hear, and God dramatically uses new empires to judge His very own. Even then, however, there is hope in God’s gracious promises: a Redeemer will come to deliver once and for all His people from their sins. God in the gospel brings forward nothing but what the Law contains. which follows it, but only perfected, extended, and enlarged. of the scriptures might have hope.